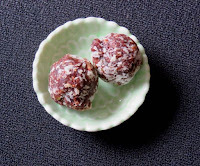 Welcome to Day #9 of Chocolate and Cacao Nibs, and Day #1 of Chocolate and Coconut Theme Week. 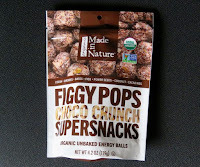 Today's Figgy Pops Choco Crunch Supersnacks* were distributed by Made in Nature, LLC (Boulder, CO). They're part of a growing number of "energy ball" offerings in the market in recent years. Moist and crunchy don't often co-exist in the same food item. 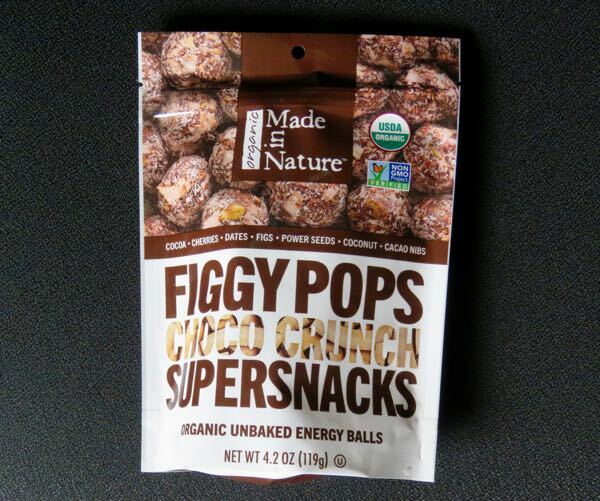 However, these organic, round Figgy Pops pulled it off. They were moist and fruity (dates, figs, tart cherries), with a hint of cocoa and coconut flavor. And they had a slight, satisfying crunch (pumpkin seeds, sunflower seeds, cacao nibs). They were lightly sweetened (apple juice) and seasoned (Madagascar Bourbon vanilla, cinnamon, sea salt). *These Organic, Non-GMO Project Verified Unbaked Energy Balls also had one of the longer descriptive product names this week.